Have you been wondering if a metal roof is the right choice for your home? 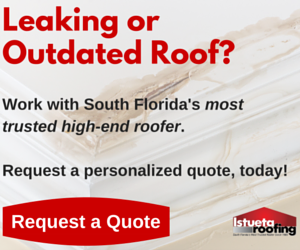 Maybe you’re considering having a new roof installed, but do you know what options are available to you in the Miami area? Metal roofing is a reliable roofing material, and can last longer than many commercially available roofs on the market today. Following are a few reasons why a metal roof could be the right decision for you and your home. They save you money on your energy bills. Many homeowners worry that a metal roof will cause the sun’s strong summer rays to penetrate the metal roof, causing high air conditioning bills. In actuality, metal roofs can save homeowners money on heating and cooling! People used to shy away from metal roofs due to the fact that they soaked up the rays of the sun, causing the interior of the structure to be warmer, thereby increasing your heating and cooling costs. Several improvements have been made to the product allowing it to now reflect the sun which can actually decrease your home’s energy cost by up to 20 percent. They’re eco-friendly. If you’ve ever wanted to be eco-friendly but didn’t know where to start, metal roofing is made from various amounts of recycled material. You can be certain that your choice to have a metal roof installed will be easy on the environment. In addition to using recycled materials, metal roofs are much more durable than traditional roofing material, which means that your home won’t need a new roof in the foreseeable future! This keeps materials out of landfills and keeps you from having to go through the process of having a new roof installed on your home again in a few years. It’s weatherproof. Maybe you are concerned about hot summers and hail in the spring. With those natural weather cycles like heat waves and hail storms found in the Miami area, it’s normal to wonder how an investment like a new roof will hold up. But you don’t have to worry about your metal roof; it can withstand hailstorms without being damaged and can even reflect heat in the summer. It seems unreal that a metal roof could function this well, but you owe it to yourself to look into this great roofing option if you live in the Miami area! It’s almost maintenance-free. This is also a great money-saver for you. Even though the initial cost can be more expensive, it is almost maintenance-free once it is installed. Some insurance companies offer you a discount on your homeowners insurance for having a metal roof on your home. Check with your local agent to see if this could apply to you. They’re stylish. Of course you want your roof to fit with the style and design of your home, and metal roofs can accommodate. From choosing the right texture and color, to deciding if you want a shingled look or a sleeker look, you have options! Once you have installed a metal roof on your Miami home, you can sit back and enjoy a barrier for your home that is not only fire-resistant but adds aesthetic beauty to your home as well. If you’re looking for a new roof that is beautiful, stylish and eco-friendly, a metal roof is the choice for your home.